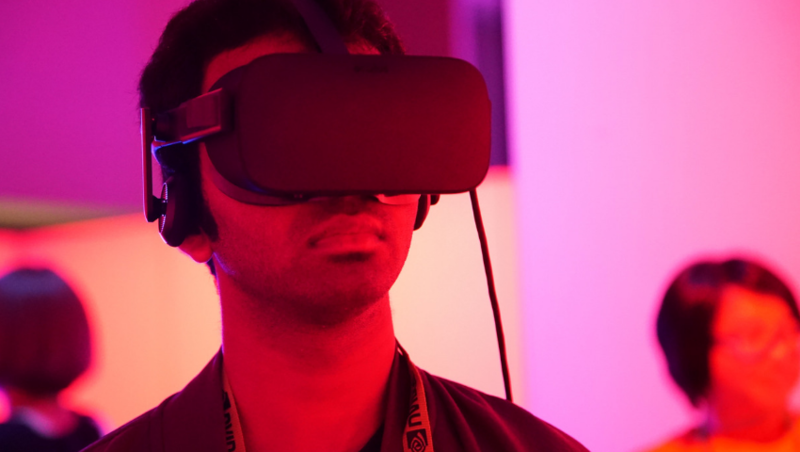 In a stretch where some are lamenting VR, it was exciting to see SXSW festivalgoers in the heart of Texas line up and wait up to an hour to catch glimpses of experiences that make use of the always-evolving medium. I recently spent three days navigating long lines in the JW Marriott Austin at the SXSW Virtual Cinema exhibition, seeing some amazing work from creatives who are still exploring how VR can be used. During my long waits, I had an epiphany: Yes, there may be feeling that VR is meandering; however, from what I’m seeing, it continues to get better and continues to amaze those who get a chance to view it. The evolution of VR is a slow one that is tough to navigate in our present society’s insta-gratification expectations. Of the small sample of SXSW attendees I asked, half said that the SXSW conference was the first time they were experiencing VR. Coming from my San Francisco-rooted tech bubble — and having been going to VR film festivals since 2014 — I wouldn’t have expected to learn that there are still so many VR-curious people who have not had an opportunity to try it. VR is and remains magical for those still putting on a headset for the first time. The problem with growth is one of opportunity and exposure. Most of the experiences at SXSW had only a handful of headsets and each could be up to 20 minutes long, so over the course of a day, there were only about 100 available viewing slots for each show. With 70,000+ in attendance at SXSW, it makes sense that we have just scratched the surface of audience potential. Based on where things are now, it’s going to take time and innovation. VR is magical and remains magical for those still putting on a headset for the first time. With such exposure problems, you’d expect creators might start looking elsewhere, but it’s because of VR’s undeniable magic that creators still believe and are willing to wait for the audience to show up in a bigger way. I saw many amazing experiences, and eight stood out as state-of-the-art examples: “Eleven Eleven,” “Incitement,” “The Atomic Tree,” “Nothing to be Written,” “The Eclipse,” and “Traverse” (though the latter was actually an audio AR piece, a noteworthy sibling to VR). The most expansive and expensive experience by far was “Eleven Eleven,” a film in which viewers follow six different characters and story lines that take place over the course of 11 minutes and 11 seconds, the time left until they all must reach the last shuttle to leave their alien planet before it is blown to bits by a desperate and cruel corporate dictatorship. Similar to the groundbreaking “The Invisible Hours” narrative by Tequila Works, Syfy’s work gave me the choice of place and time so I could follow the each story line as it wove around and through the others. The coolest mechanic of the experience was the ability to pop into “goddess mode” where I could scale up and look down on the alien port city, ultimately deciding where I wanted to hop back down to “human” scale. The world design was expansive, colorful, and appealing. The creators chose a stylized look for the humanoid characters and avoided the uncanny valley, which can feel even more creepy in VR. As one of the more popular showcases at the venue, and with only four active headsets, the producers had to limit viewing times to only 15 minutes. Realizing there was about 90 minutes of actual content, I felt rushed in exploring the tapestry of these tense 11 minutes, but it did the job in making me want to return to the world for subsequent viewings. I am personally a big fan of “space and time” exploration across interweaving narratives as a unique value that you can only get in VR. It reminds me a lot of immersive theatre, like the popular “Sleep No More” (2011), where, as a free-roaming audience member, you have the choice to follow whatever story line you like. Immersive theatre, though, can sometimes be angst-inducing because I’m always worried that I’m missing out on a critical scene somewhere else. What makes a similar conundrum so special in VR, however, is that I can also control time, allowing me to explore at a pace I enjoy. This 360-degree cinematic made me laugh, something that is hard to do in this medium. Primed to think I was about to watch a dark romantic comedy, I went into the headset expecting a sinister twist or tragic turn of fate. During the entire viewing, I was cringing as I anticipated the worst of what was turning out to be a cruel round of pranking between a young couple. The story introduced two innovative storytelling mechanics that could not be pulled off as effectively outside of VR. At its start, the camera is placed so that viewers feel suspended about two meters above the couple in bed, with their arms comfortably wrapped around one another. This heightened my personal intimacy with the characters and increased my dread that something bad was about to happen. The second interesting mechanic was during the peaks of emotional tension. After telling his girlfriend that he cheated on her with her sister, I watched the her enraged response from his point of view (POV), slowed down to half speed. At first, I thought this was a powerful way to convey his angst-ridden perception, but then I heard an internal monologue about how much he’s enjoying that she’s falling for his lie. It’s a type of editing trick that could work well in film, but mixing an emotionally charged POV with the feeling of presence you get in VR pushed it to a new level. The mechanic is repeated from her POV when she tells him that she’s dying. It was only at the end that I realized this was just the couple’s twisted way of playing intimate head games with each other. In the end, it turned out that I (the viewer) was the one being pranked into thinking this was a darker story than it really was. I laughed out of relief as I watched them kiss and make up during the end credits. “The Atomic Tree” is a short documentary about a famous 400-year-old bonsai tree that survived the atomic blast at Hiroshima and was gifted from Japan to the U.S. in 1970. The story speaks of the tree’s origin, its many generations of caretakers, and how — after surviving the apocalyptic blast during World War II — it became a symbol of repaired hope. There was one particular moment during the experience where they lingered inside a meditation room at the monastery where the bonsai was first grown and cared for. As I looked around during this idle moment of storytelling, I began to feel the peace of the scene as if I were there myself. The idle pause would have felt like bad pacing in a film, but in VR it felt like a gift of present mindfulness. “Nothing to be Written” by the BBC is a brilliantly executed, experiential piece that explores how the soldiers of World War I relayed the nightmares of trench warfare to their families at home through postcards. More experience than story, it played around with mixing a feeling of presence in a traditional British home with the feeling of being in the blood-soaked trenches and medical tents on the front lines. The piece introduced a visual innovation in which the movement of soldiers was stretched out and blurred almost like time exposure in 3D. Their blurred forms looked like ghostly apparitions that passed around and sometimes through the viewer, heightening the illusion that you are hearing stories passed from generation to generation. Most notably, this experience was presented on the all-in-one and accessible Oculus Go, making it much less error-prone and easier to usher a lot more people through the experience. The best social VR experience at SXSW goes to “Eclipse” from BackLight studio, as it delivered a level of realism and experience that blew my mind. Designed as a four-person, escape room-like experience, I worked together with three others to play the role of astronauts sent to rescue a derelict ship parked on the edge of the sun’s corona. The experience had clever design so all could operate in a 30-by-30 foot space, using clever false geometry tricks like virtual moving platforms and elevators to make us feel like we were traversing an expansive spaceship. You have to work together as teams through eerie and tense situations to bring a dormant ship’s systems back online and find a way back home. I found the interactivity, cooperative play, puzzle solving, and overall sense of adventure riveting. Although not VR, the Bose AR tech that debuted at SXSW turned a lot of heads and got those who work in VR thinking about how this new form of audio-only, presence-based technology could be used for storytelling. “Traverse,” from Vrai Pictures and Jessica Brillhart, was a compelling demo where attendees were given Bose AR-integrated headphones and a handheld mobile device. As I walked around a 20-by-20 foot space, I could watch on my mobile screen as the accelerometer in the headphones updated my position, and listen as the sound in my headphones made me hear stems of audio from Elvis Presley recording sessions that were actually originating from sources spread throughout the room. This tech is going to have huge implications for how the headphone devices we are already used to wearing are going to open up a new platform, enabling creators to deliver contextually aware and spatially grounded content to people’s ears without also needing to cover their eyes. This is an important example of how presence-based technology will start to spread more widely beyond just festivals and conferences. It is going to take time for VR’s audience to grow; longer than we’re used to compared with other forms of modern technology. But, I’m confident it will be worth the wait. Meanwhile, creators will need to continue innovating and developing increasingly compelling, unique uses of the medium, which is why conferences — like Sundance, SXSW and SIGGRAPH — need to continue to provide spaces where creators can connect with their passionate, growing audience, and convert new members into believers. I cannot wait to pull off SIGGRAPH 2019’s groundbreaking VR Theater, a 55-person seated theatrical experience, with your help. Submissions are due tomorrow and I encourage you to share your innovative work with us by 22:00 UTC/GMT. If you are a creator in the VR space looking for new ways to show your work and to discover a curious, passionate audience, then the SIGGRAPH 2019 VR Theater is where you should be.